De Blasio's crowd size ranks with some lower-tier candidates lagging in the already wide Democratic field. Sen. Kirsten Gillibrand (D., N.Y.) has drawn similar numbers in the Granite State. Sen. Elizabeth Warren, on the other hand, attracted up to 300 people at recent events. Warren has been in fourth place among Democrats in New Hampshire primary polls. De Blasio appeared in New Hampshire as part of a roundtable on mental health, along with 14 panel members, who comprised most of his audience. Aside from the six reporters sent to cover the event, only six people showed up to see the mayor of America's largest city and possible presidential contender speak. The mayor has been touring New Hampshire with his wife, Chirlane McCray, as he contemplates a possible presidential run. In addition to promoting McCray's ThriveNYC, a mental health program currently under scrutiny for its cost-effectiveness in the New York City Council, the couple stopped at McCray's family home in Claremont. For decades they were the only black family who lived full-time in the New England town, after emigrating from Barbados, she said. McCray reminisced to reporters how she would visit her extended family in New Hampshire as a child. "We came up here many summers, we’d have family gatherings where we’d come up and visit them," she said. When running for mayor of New York in 2013, de Blasio also campaigned on his family, in an effort to prove he was not "some boring white guy," according to his daughter, Chiara. 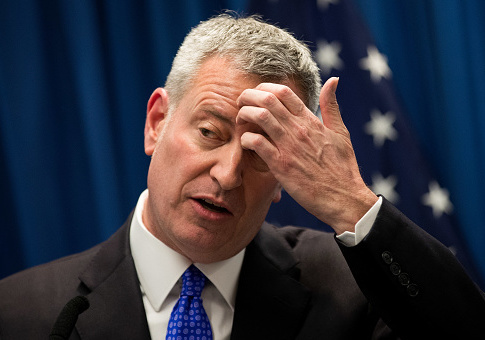 Numerous de Blasio allies have warned the mayor against a White House bid, with some aides telling Politico that the idea would be "f—ing insane" and "idiotic." Even McCray has recently looked down on the idea, saying on Politico‘s Women Rule podcast that she doesn't think "the timing is not exactly right" for her husband. This entry was posted in Politics and tagged 2020 Election, Bill de Blasio, New Hampshire. Bookmark the permalink.